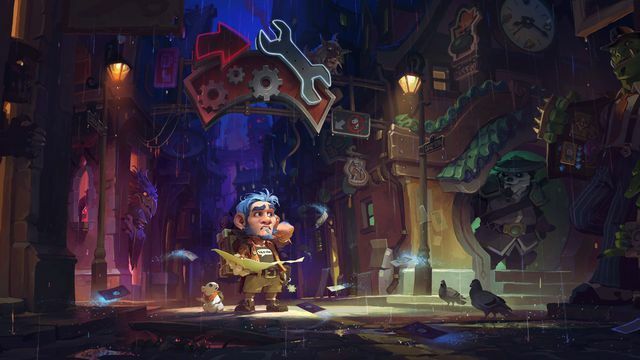 Hearthstone’s next expansion, Mean Streets of Gadgetzan, was first revealed early this month as part of the BlizzCon 2016 event. At the time, Blizzard said the expansion would launch some time in early December. True to its word, the developer revealed a launch date during a Hearthstone Twitch stream today that’s about as early in December as you can get. During the stream, Hearthstone senior game designer Matt Place and commentator Dan “Frodan” Chou played through four games, showcasing a couple dozen new cards that hadn’t yet been revealed for Mean Streets of Gadgetzan. After the games, they announced the expansion’s release date: Thursday, December 1. The new set will contain 132 new cards, including for the first time tri-class cards, which are usable by any of three classes. Previously, every card in the game has been stuck to one class or a neutral usable by any class. The expansion includes tri-class cards in a number of new “gangs,” each with their own gameplay mechanics and focuses. We got a chance to reveal one of the cards from the expansion, a shaman class spell named Devolve. You can check out our archived Hearthstone video content on our full YouTube playlist.